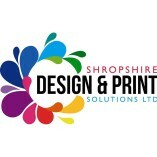 At Shropshire Design and Print Solutions in Oswestry, we pride ourselves on the high quality of service. We believe that the key to a successful business is to listen to... our customers' needs and do everything we can to help them in any way possible. Our regular customers return to us time after time because they know that we will go the extra mile for them. Contact us today to discover how we can help you. SD&PS have a friendly and helpful team. The products I have used are of a high quality and are reasonably priced. they listen to our requirements, come back with options and advice, nothing too much trouble and we have always been blown away by the end result, even better than we had hoped in each case.